Everbody has those products, you know the ones you cannot live without and often wonder how you even done your makeup without them.. yep them ones! 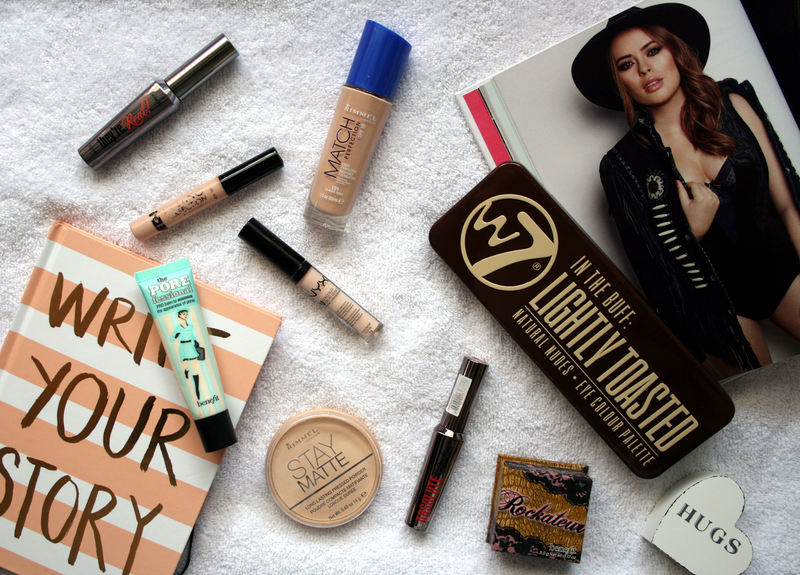 So today I decided to share my must haves that I will continue to repurchase again and again. Rimmel Match Perfection is the way to go for me. It gives a gorgeous glow to the skin and is medium coverage but you can build it up. Theres a good range of shades in this range which I love especially because I'm so pale. I've been using this for years now and honestly no matter how many times I try a different foundation I always come back to this one. Collection Lasting Perfection Concealer is probably in everybodys makeup bag by now. It's affordable and one great product! It's creamy and conceals really well without being too heavy. NYX HD Concealer has quickly become one of my favourite products ever. It's so creamy and full coverage its amazing. It can hide spots and blemishes as well as any discolouration or bags under the eyes. You can even use it to highlight which I will say looks absolutely fab on the skin! Stay Matte Powder by Rimmel is forever my setting powder repurchase as it's so cheap and helps keep your makeup set in place for hours. It's also such a great price and comes in different shades but I always use transparent. W7 Lightly Toasted Eyeshadow Palette* One of my favourite palettes and it's an absolute dupe of the ever so famous Naked palette by Urban Decay! You can find out all about it in a post I did here. Benefit Rockateur Blush Ever since I got this I haven't stopped using it, once something is Rose Gold it's a winner in my eyes. The colour is also so gorgeous on the skin! Benefit They're Real Mascara Probably everybodys holy grail mascara and I don't blame them. I've went through so many tubes of this it's crazy but it's just because I pick it up so much! W7 Absolute Lashes Mascara So if you've been reading my blog since last year you'll have seen the post I done about this mascara and the Benefit one. You can find it here! I'm almost out of this so I think it's time to order another! What products will you forever buy? I love Rimmel foundations! I use the 25 hour lasting finish one and have been for ages now. The NYX concealer sounds lovely, I'm definitely going to have to try that soon! The nyx concealer sounds really good! I agree with Match Perfection and Stay Matte powder! I've been eyeing up the W7 palette recently, I have one in the shade 'in the buff' which I love so maybe I'll have to try the lightly toasted palette too.